Are the Star Wars Anthology Films a Lost Opportunity? All eyes may be on the Star Wars sequel trilogy, which kicks off next month with Star Wars: The Force Awakens, but it’s actually the so-called Anthology films that hold the most creative potential. Starting with Rogue One – A Star Wars Story on December 18, 2016, Lucasfilm and Disney will be using every “off” year to tell a standalone story that can be set anywhere in the Star Wars galaxy or at any point along its timeline. The possibilities are endless. Yet what has been announced so far barely scratches the narrative surface. Rogue One is set just before Episode IV: A New Hope and tells the story of how the Rebel Alliance’s spies managed to acquire the Death Star’s blueprints and deliver them to Senator Leia Organa. The untitled young Han Solo movie, scheduled for release on May 25, 2018, follows a young Han, and shows audiences how he “became the smuggler, thief, and scoundrel whom Luke Skywalker and Obi-Wan Kenobi first encountered in the cantina at Mos Eisley.” Finally, the third entry will explore the origins of Boba Fett, although it’s currently without either a director or a release date. It’s hard to argue with the fan appeal of either Han or Boba, and there certainly can be enough in their backstories to craft compelling adventures. And even though Rogue One seems to be closer to the mark of original stories using the Skywalker family’s trials and tribulations as just a backdrop, that too is intrinsically tied to the main films’ plot. There are several thousand years’ worth of material to draw from for these one-off tales – is Lucasfilm wasting a giant opportunity here by ignoring the vast bulk of it? Is it really best to play it safe instead of playing it creatively? The answer, it turns out, is not a simple yes or no; unlike the Force, there’s quite a bit of grey room. Let’s dive into it, then, and see if we can’t answer the question: Are the Star Wars Anthology Films a Lost Opportunity? Unused young Han Solo concept art from Episode III: Revenge of the Sith. Seeing a teenage Han Solo may not be as viscerally exciting as, say, following an unseen, big-screen battle in either the Clone Wars (the prequel trilogy’s domain) or the Galactic Civil War (the original’s), but it still holds a great deal of potential. First and foremost, there’s the not-insignificant matter of exposition – or, rather, the lack thereof. Audiences are already intimately familiar with that scoundrel, Han, having been on adventures with him already for three films (and counting). That means there’s a lot less that has to be explained to viewers, which in turn allows the story to hit the ground running – and given the floating negativity in fan circles towards the prequels, which were forced to spend an inordinate amount of time setting up their governmental, social, and commercial realities, that’s a resounding positive for Disney. This is especially true when taken on a macro level, as both the Han and Boba movies will exist in the interstitial period between the first two trilogies, with their readily identifiable backdrops of the Galactic Empire and the fledgling Rebel Alliance. Had Lucasfilm opted to move either backward or forward in time, to a period which hasn’t previously been depicted on the big (or small) screen, not only would the new set of characters and the conflicts between them have to be introduced, but the galactic state of affairs would have to be painstakingly established. What, for instance, was the first rule of the Dark Lords of the Sith like, before the Jedi rose up, defeated them, and oversaw the creation of the Old Republic? No one knows – not even Lucasfilm’s new Story Group, which would require a far lengthier scriptwriting process that would, in turn, eat into the already-tight production schedule. Then there’s the audience’s resonance with the character of Han - an emotional connection that is not guaranteed to be recreated with a brand-new set of characters engaging in a brand-new set of stories in a brand-new corner of that galaxy far, far away. There’s an emotional inertia at work with beloved characters on both sides of the screen, allowing viewers to instantly have a greater sense of intimacy and filmmakers to engage in a story that can practically (maybe?) write itself. Underlying all of this, however, is the fact that simply choosing previously-established material doesn’t automatically preclude originality from being part of the equation. There is still ample opportunity for new wrinkles on the Star Wars storytelling formula to be introduced or intriguing new individuals and locations to be revealed; Lucasfilm has already gone on the record as stating that Rogue One will feature a more militarized style, given the lack of Jedi or Sith Lords and the presence only of soldiers. Besides, just as Rogue One is already revealed to be doing, keeping the Anthologies within the six-film timeframe allows these side stories to interact with the core Skywalker/Jedi-vs.-Sith mythology in a way that is largely absent with other time periods. This certainly isn’t canon, but it gives the idea of what could be on the big screen. Let’s revisit that birth of the Republic scenario. Not only is there the intrigue of exploring a new time period hitherto untouched in (canon) Star Wars, there’s also a spectacle that no other film has yet managed to deliver on: literally thousands of Dark Lords of the Sith battling against thousands of Jedi Knights. The story could even end with the survival of a lone Sith and the subsequent creation of the Rule of Two, with clear precedents to Darths Plagueis, Sidious, and Vader. Not only would this help to fill in the backstory, it could even provide the same opportunity for different genres that Marvel has been experimenting with the last few years. Yes, Rogue One is a solid start, but why not do the Star Wars equivalent of Captain America: The Winter Soldier's political thriller or Ant-Man's heist films? Obi-Wan learns about the Lost 20 from Jocasta Nu in this Episode II: Attack of the Clones cut scene. Both of these premises contain a grandeur and – let’s be frank – an epicness that is wholly absent in any of the three announced Anthologies. They also contain an excitement that may even be greater than seeing a continuation of the core narrative – these standalones are meant to provide sneak peeks into those corners of the Star Wars mythos that would otherwise never be exposed, after all. It’s hard to get a fan’s blood pumping more quickly than that tantalizing description. There’s also, of course, a far greater danger, as well. Beyond the greater narrative footwork that is involved in introducing these new scenarios, there’s also the fact that the filmmakers wouldn’t have the work of George Lucas and his original teams to fall back upon, from the narrative to the art design. It’s one thing to imagine his universe just 30 years later, as J.J. Abrams and company are doing for The Force Awakens, but what about a millennium earlier? What does the galaxy look, feel, and sound like? Did technology advance a lot since then, or barely any at all? 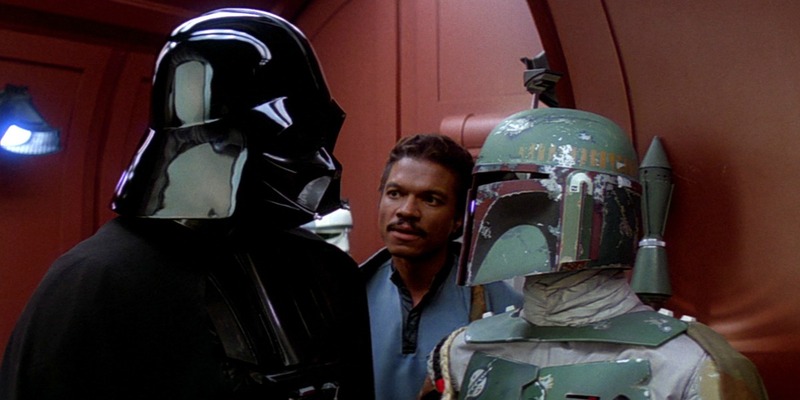 It’s more than possibly failing to come up with a character as beloved as Boba Fett – it’s about creating a convincing, substantive iteration of the mythology that is still its own, separate entity. When a company pays north of $4 billion for a property, it’s easy to see why the more potentially fraught path is the one systematically ignored. On paper, it’s easy to conclude that Lucasfilm blew a chance to get really creative and sprawling in its storytelling ambitions, but given the dangers involved of going the original route – and given the caliber of the filmmaking talent accumulated so far with the announced spinoffs – the choice of playing it safe may very well end up proving to be the right one when everything is said and done. Which stories would you prefer to see tackled in the Star Wars Anthologies? And what do you hope to see included with the Han Solo and Boba Fett installments? Let the galaxy know in the comments below.